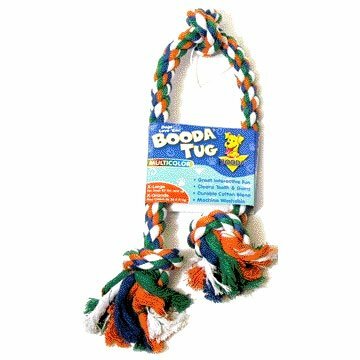 The Multi-Color Booda Tug is a dual action, multi-color cotton blend tug that can be used for interactive play or enjoyed as a solo dog chew. Three sturdy knots act as a hold for the dog and provide a firm grip for the dog owner. Dog Rope Tug Toy - Multicolor has different options and/or variations, please choose below. 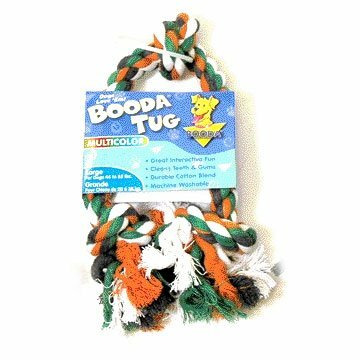 The Multi-Color Booda Tug is a dual action, multi-color cotton blend tug that can be used for interactive play or enjoyed as a solo dog chew. Three sturdy knots act as a hold for the dog and provide a firm grip for the dog owner. The Multi-Color Booda Tug creates a fun and easy way to floss gums, brush teeth and freshen dogs' breath and helps to maintain their proper oral hygiene. Large - 14 inch Length - Multi-Color - 2-Knot - For Dogs 25 - 45 lbs. Medium - 11.5 inch Length - Multi-Color - For Dogs 12 - 25 lbs. Multi-color fine gauge cotton yarn makes these rope bones extremely durable.